When two septuagenarians and an octogenarian meet to chart their politics in the midst of squalor, we are nothing but doomed. When one of the septuagenarians openly makes known his burning ambition to be president, how do we make out of it? It confirms why we remain third world and get stuck at the bottom rung of undeveloped countries for years to come. We have known what happened to us when a former actor armed with nothing but charisma was pushed in the middle isle and pretended to lead. Has familiarity bred contempt when for the last three decades this former local official ruled the roost in his premier city? From time unremembered one legend of a mayor prophesied that this hitherto young lawyer so young and so corrupt went on to bench warm a cabinet post under Ferdinand Marcos and a senate seat under Cory and earned the moniker senator attack and collect, collect and collect. As one wag said, “politicians and diapers have one thing in common. They should both be changed regularly and for the same reason.” Unfortunately, we are stuck with these diapers for the rest of our lives. Now these three stooges are enjoying the political attention showered on them given the lame duck proclivity of the sitting president and his apolitical aura. One sister openly complained amid mounting criticism on his brother of being not at par with the job, “sana 2016, na!” The sitting president is so transparent that these three amoral pygmies went on their business of political fence mending, nay, fortifying, with nary a thought of antagonizing any capo dei capi. It is in the course of things that presidents chart any political direction and not by a clique independent from the power center and incredibly allowed with unbounded acknowledgement. With their political posturing of strengthening the ramparts of their political parties under the guise of forming a formidable coalition in preparation to the 2013 elections, these old men betray their incapacity for patriotism. What is ironic is that nowhere in sight are the emerging young men to whom the scepter of generational leadership rightly belongs. 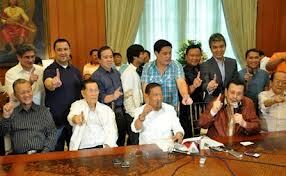 Brilliant young men like Koko Pimentel, Migz Zubiri and Sonny Trillanes content themselves in reactive politics. The initiative regretfully does not come from them. What comes out of their collective thoughts are in response to the posturing of the senior non-statesmen. Instead of acting as conscience brake to the runaway rampage of the old men, this promising group pathetically rides on the mindless politics of the trio. Vice President Jejomar Binay wants to replicate the Cong Dadong experience. Left out in the cold by the Garcia administration, then Vice President Diosdado Macapagal barnstormed the country for four years with no pretensions of his intention of running for the presidency under the Liberal Party. In the process he reinforced the party to the grassroots level and gained a major foothold in Congress in the ‘60s where one Senator Ferdinand Marcos, an LP stalwart, was his Senate President. A couple of generations after, Binay, with the Macapagal template, is on his own road show of unashamed single-mindedness to capturing the presidency bringing with him his brand of Makati dynasty in the palace. The statistics are tantalizing: Binay gets the 40% Erap’s endorsement to his delirious masa; and the cumulative pledge of LGUs at 25%. Armed with these figures, the triad feels they can clean LP’s clock both in 2013 and 2016. Binay also wants to break some records too, as the only President who gets a clear majority, in fact a landslide, since 1953 when Ramon Magsaysay beat Elpidio Quirino with 68% of the vote. Each one of us has a score to settle, but ignored by FVR, his becoming president is his own vengeance. Just like Erap’s, his ascension to the presidency is a matter of time. But four years is an eternity, just when Manny Villar was into wrapping the position up just a bare eleven months into the elections in 2010. The death of Cory Aquino re-wrote the lines on Villar’s palm. Jojo Binay and Erap and Maceda are making sure that paying the tab is not for them to take. With an eternity from here to 2016, they are making sure that the big spenders are kept on notice. In Erap’s calculation, a 4-year preparation is enough to vacuum up all imaginable pockets of the traditional donors. Erap’s genius is telling his partner that who knows they might be even tapping the virgin patrons who have never publicly chipped-in in an election: Ramon Ang, MVP, the Sys, the Yuchengcos, the Gotianuns, and the southern and Mindanaoan billionaires. In 1998, Erap swaggered as if he was the administration candidate. He was awash with cash. Awaiting his oath taking, Binondo donors made a beeline to his Polk’s door. With billions in his war chest, a veritable gaming table where the Comelec is off limits, he was generous enough to hand out balatos to his select political allies. To Binay’s financial consultants, the 2016 elections is the best thing that ever happened to their client who is hounded by questions on his wealth. His becoming President at last drives the last nail to his SALN. Everything is legit and he can sleep soundly. Erap is telling Binay that by preempting his rivals by announcing his presidential run in 2016 not only notifies the contributors but a strategy of shock and awe as well. The message to the likes of Mar Roxas is “why run when the odds are already stacked in Binay’s favor?” Jorge Araneta is beginning to have sleepless nights from here on till 2016. Is the family willing to risk all the remnants of Mar’s recuerdos? The declaration is enough as a disincentive to potential challengers. Contrary to conventional norm, an early announcement will not decimate the resources of the declarant but rather a deterrent to political parasites who are out to Villarize Binay who, from all indications, appears formidable. Truly, there’s nothing hypocritical about that. Is Binay’s tack a clear message to the sitting president not to tinker with the Constitution? The current president is the ideal occupant within where to spearhead a constitutional amendment or revision. A change in the form of government is opportune. A presidential template has for a century eluded us the true destiny of this country. It is high time for the sitting president to seize the moment. While his mother reinstated the presidency (or naively thought that it is democracy itself), the son, sensitive to the changing times may divert the ship of state towards our neighbors’ tried and tested parliamentary form of governance. Don’t let The Triad’s political hernia hobble us. Very sharp analysis. Can cause pain to some.